Exterminate It! is a program to rescue us in order to fight against all the computer security threats, trying to provide all users with what they need the most advanced or detection, real-time protection and regularly update. Exterminate It! 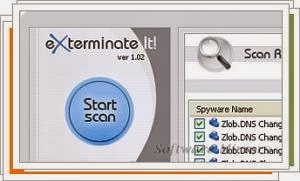 has only a few settings mostly related to the configuration of Internet connection and anti-rootkit tools, the scanning process is just basic. There is only one scanning mode that controls the entire computer for malicious files, which means that there is no option to look into a single folder, or scan of a particular unit. However, Exterminate It! have a very easy to use interface, because all things are well organized in a bulleted list, which allows you to initiate a scan, update, or check out the options for some configuration tools.